Upon arrival the groundskeeper will convey a sense of urgency. She must take you through each detail of the house – the lighting panels, open-air skylight, onsen (hot spring) and kitchen cupboards before she leaves you with the key to enjoy the house and its immersive artistic experience, the nature of which is still beyond your grasp. 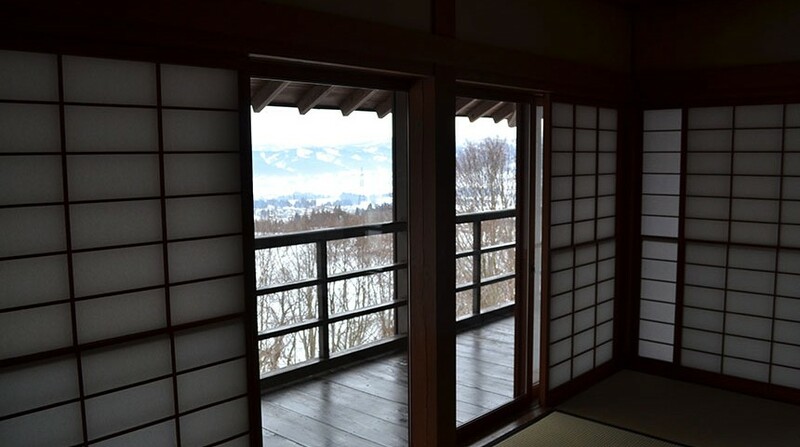 If you have the house to yourself, you have the option of sleeping in any of the three tatami-pillowed rooms. Behind the sliding doors of the closets lie stacks of futons and plush, heavy duvets. The kitchen cupboards house enough glassware and utensils for a large dinner party. A stone path leads from beyond the door just below the stairwell, all the way around the house to the open air onsen. Be warned, should you forget to turn on the strip of LED lights that surround the stone bath, you will not be able to navigate the onsen at night. Your bento (Japanese lunch box) will be dropped off within an hour of your house tour. Now, all you must do is wait. 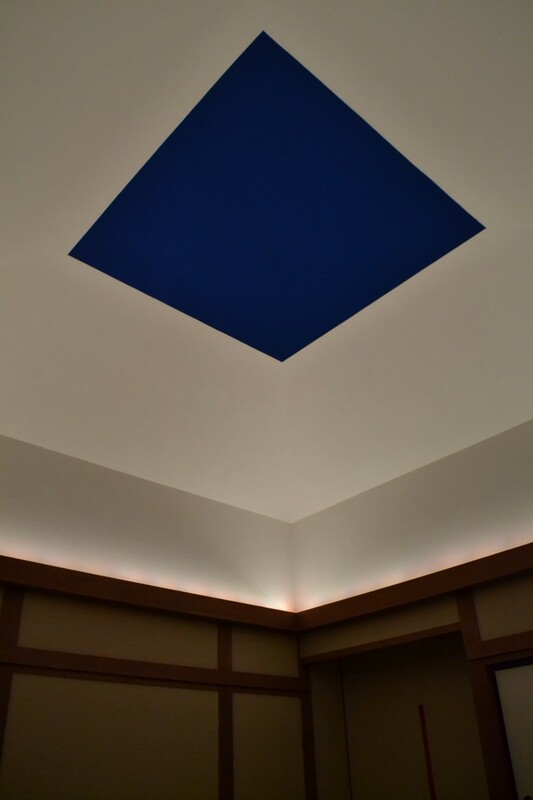 James Turrell, the designer of the House of Light in Niigata, is an American artist whose medium is primarily light. While he has a number of light installations in museums throughout Japan, this is his only project within a traditional Japanese edifice. As a westerner, he sought to work with the materials and ideologies of a Japanese house. He played with the paper shadows of shoji (Japanese paper divider) doors and manipulated the unfiltered light and darkness of the countryside. As the mountains begin to fade with the softness of the early evening light, the house is illuminated pink from within. Open the sunroof and marvel at the contrast. The diamond shaped aperture cut into the roof conveys lines so straight and corners so sharp, it looks like a brilliant blue post-it note you might peel off of the slowly evolving background; mauve, magenta, violet. In all, the light show lasts for about an hour. The sky, finally dark, appears black as the indoor lights settle into a brilliant, silvery white. At this point, you’ll find furoshiki-wrapped bento sitting in the hallway. The meal is decadent; small dishes of fresh sashimi, miso cod, tofu in a dashi broth, tempura, pickles and seasonal vegetables. For dessert there is a light almond pudding with one perfect strawberry. Bentos cost ¥2,000-¥3,000 per person, a surprisingly low price-point for such a spread. With an open-air onsen as its only distraction, The House of Light encourages relaxation. Inside the bath, below your shoulders, your body will glow, luminescent with the turquoise influence of the LED lit pool. Any body part that’s above water will appear distorted by the darkness of the stone room. To enter the bath is to interact with art that is intrinsically linked to the house. 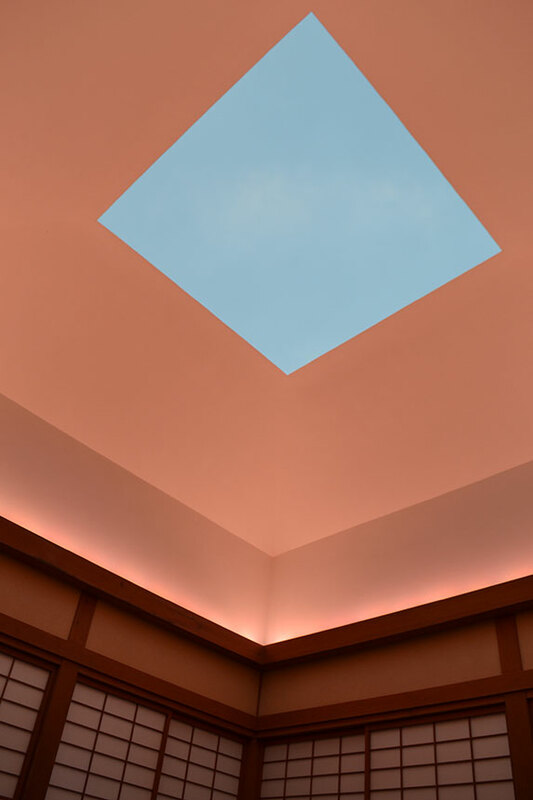 Turrell’s art is site specific; you must travel to the House of Light to understand this body of work. As the sun comes up, the house greets the day with a vibrant resplendence of color. 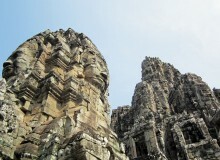 To get there, you must embark on a sort of art pilgrimage. 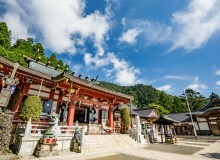 After taking the Shinkansen to Echigo Yuzawa, you must then take two different local trains to get to Tokamachi, Niigata. A cab ride through a sleepy, snowy countryside town gets you there just in time for sunset. Timing is crucial. Should you arrive late, you’ll miss what is surely the purpose of your visit: the light show, timed with the sunset and sunrise. Jordan is a native New Yorker who is living and working in Tokyo. 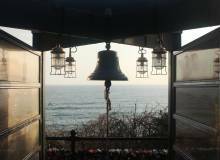 She is a teacher, freelancer, and traveler.